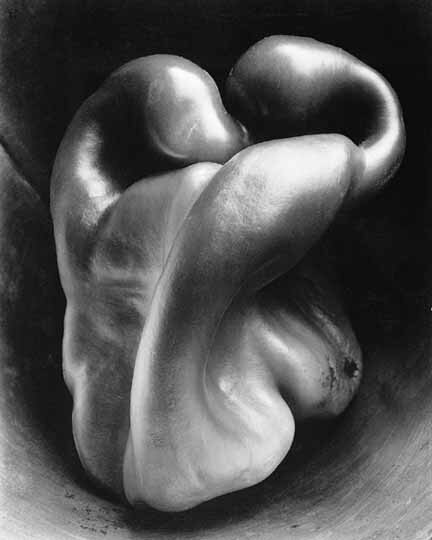 Many years ago, I came across the famous photo of a bell pepper taken by Edward Weston. The pepper was sensuous and and appeared to have a satiny skin. I was transfixed and flummoxed. Where did Weston find such a thing? Turns out he grew the pepper himself. But that didn’t keep me from scouring bins of bell peppers at the grocery stores. Nope, no luck. They were all the same plain boxy shape. No quirks, no twists, no character. Let’s face it, veggies at the supermarket are just plain dull. It wasn’t until I started hanging out at Bee Heaven Farm taking photos of CSA shares that I came across produce with character. Hallelujah! Of course, I started photographing them! 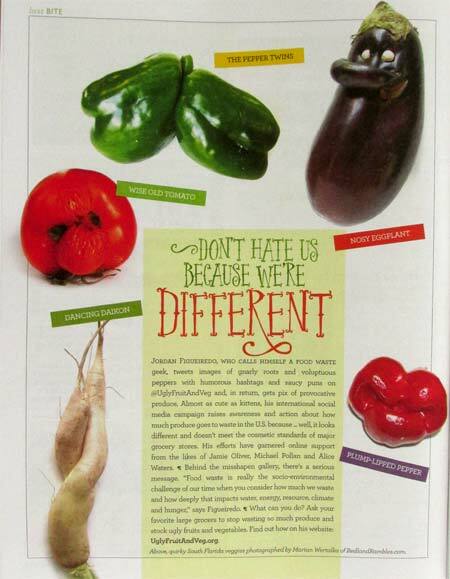 And now, a small part of my collection of wacky veggie pictures has been published on the inside back page of the spring issue of Edible South Florida. Thanks to editor Gretchen Schmidt for selecting the pictures! Large heirloom tomatoes like to morph various shapes. 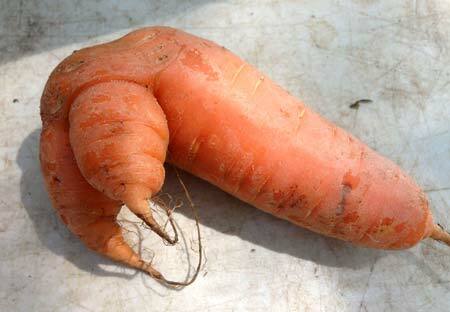 Carrots get naughty. 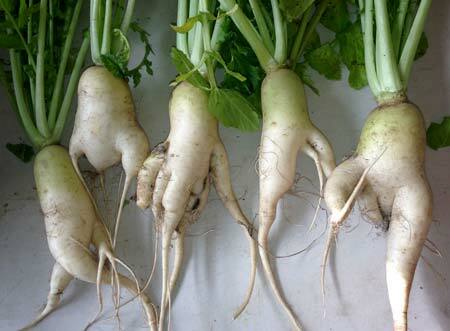 Daikon are more elegant and like to twist and twine. Eggplants grow noses. And bell peppers tend to grow lobes and knobs. (I still haven’t found one as elegant as Weston’s but that won’t keep me from looking.) Mother Nature is coloring outside the lines. One man, Jordan Figueiredo, is on a mission to get supermarkets to sell veggies with character, because creating consumer demand for misshapen produce is a good way of reducing food waste. Growers and wholesalers prefer uniformly shaped, blandly “perfect” produce for supermarket sales — and us shoppers have come to expect bland as normal. We lose out on nature’s riotous creativity, which gets wasted, rotten, thrown away. You can read more about Figueiredo and his mission in the article next to my pictures. His web site lists links for grocery chains, where you can be an ugly veggie activist too. Shoot an email to corporate. Or, ask the produce manager at your favorite grocery store, and remember to keep asking. With enough demand, “uglies” can and will start showing up routinely in grocery stores. Don’t forget, “uglies” are fun. Over at the farmers market, I’ve seen kids reach first for eggplants with noses, and moms get a giggle at risque carrots. And of course you can start your own collection of produce pictures. Maybe you’ll be the one who finds a pepper as memorable as Weston’s #30.
always love your articles. and the photography!